The above photos show the parade of shops in Highbury Park Just after the Great War (left) and present day (right). Click on these photos for larger image. The left picture shows Lambert Harris's shop on the left. The floor immediately above were offices and the top floor flat was where Adelaide Harris, now widowed , lived with her two children. She never liked this flat so when her uncle Lambert aquired the premises three doors away at 106 she moved into the first floor flat. Her brother Herbert Musgrove at this time moved into her vacated flatas he was working in the shop below. 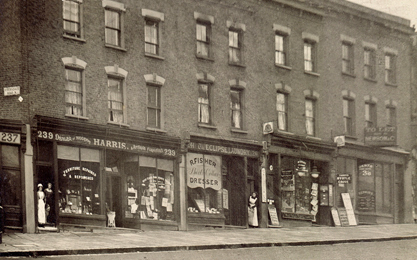 This old photograph shows this parade of shops just before Lambert Harris opened his second shop. Next door is the Eclipse Laundry followed by a News Agent Tobacconist named Frederick Venus. Next door is the empty shop that Lambert was soon to lease. The right hand present day photo shows this parade of shops relatively unchanged. 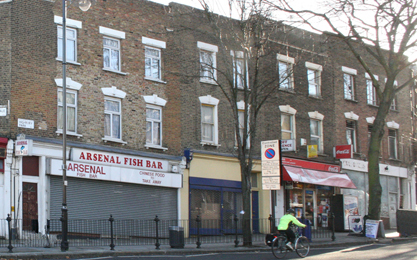 There is evidence of bomb damage to the upper brick work above Lambert's original shop now The Arsenal Fish Bar. Number 108 has remained a newsagent and 106 is again empty. 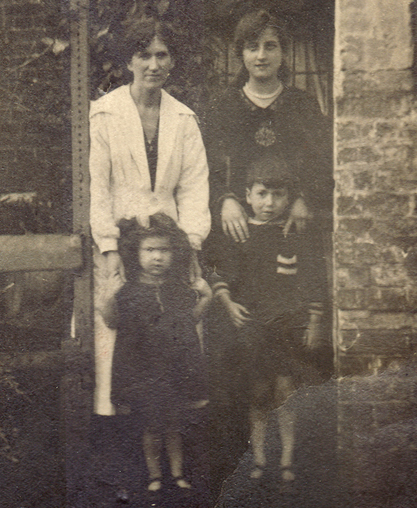 Pictured left is Adelaide and her children Ruby and Herbie with her cousin Ivy Harris, who was soon to marry her brother Herbert Musgrove. Below is the Electoral Register dated 1928 for this parade of shops between 106 - 112 Highbury park. Adelaide's brother Rupert Musgrove has now moved into her flat above 106. He lived here for two years until Adelaide moved.